We offer financing options on orders over $5000. Dexter HEDLOC Hammers are used for delicate and precision assembly work, to avoid marring the mating surface. They are used in tuning engine blades in engines and in electric generators. The Manufacturing and automotive sectors have been using these hammers since they were introduced on the market in December 1960. Gunsmiths have found the smallest hammer an invaluable tool for their craft. Dexter Hedloc hammers are just one of many tools manufactured by Dexter Innovative Solutions in Orange Massachusetts. Technicians in the valve industry favor the Hedloc Hammer over standard dead blow hammers as they do not fracture, and release hundreds of shot pellets into the pipeline that must be removed. Dexter HEDLOC Hammers use unique interchangeable head-inserts, in a selection of Babbit, brass and nylon to meet your varied needs. The HEDLOC with Babbit inserts will match the weight of standard Babbit hammers. With Dexter HEDLOC Hammers, The WEIGHT is in the HEAD, not in the hand. Available in 4 sizes as shown below. • 3/4 pound hammer with 5/8" head. • 1 1/4 pound hammer with 7/8" head. • 2 1/4 pound hammer with 1 1/4" head. • 4 3/4 pound hammer with 1 1/2" head. 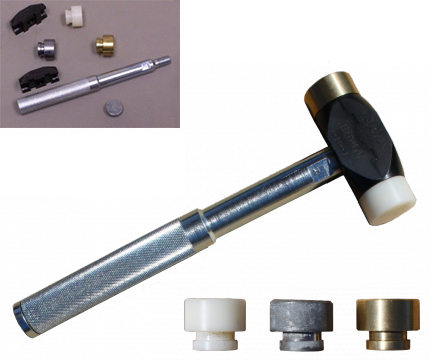 Save money by replacing worn heads with New Hedloc inserts rather than buying a complete hammer. Proudly Owned and Operated in the U.S.A.